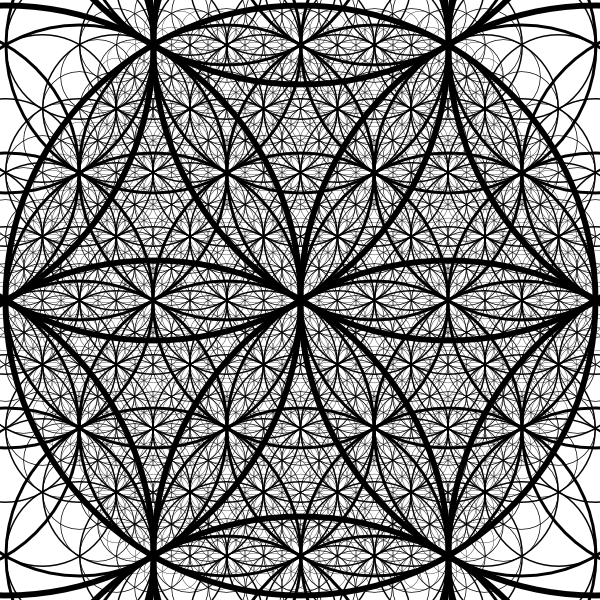 This entry was posted in Algorithms, Design, Geometry, Logic and tagged art, computational complexity, kolmogorov complexity, low-complexity art, mathematica, mathematics, patterns, programming, turing machines. Bookmark the permalink. 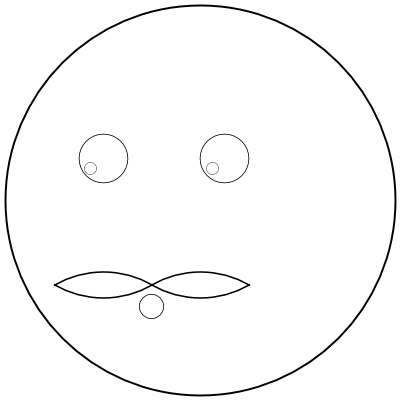 Technically this circle construction is a fractal (if we drew larger circles and smaller circles ad infinitum), but we are selecting pieces of the fractal with the goal of constructing a specific picture. The difference here is that we have well-defined curves to choose from, whereas in something like Mandelbrot’s set, it’s a gradient. Of course, there are other fractals which draw specific pictures, like the Barnsley fern, but these sorts of constructions have a disadvantage for our purposes because each algorithm is specific to the object being created. With this construction we have a distinct analytical advantage. Any drawing can be drawn, so our framework is universal. And when we restrict our attention to this particular “style” of art, any drawing can be compared to any other drawing in terms of complexity. We could theoretically construct both the Mandelbrot set and the Barnsley fern using the coordinate system, but our real problem is to find those drawings which have very low complexity in this framework and are still beautiful. This is a nice attempt to compare the Kolmogorov complexity of images, but what happens if you try to compare the complexities of the rather simple geometric figures of a suare and a circle? Your system will tell you that the square has an infinite complexity (which is not true) and the circle is rather simple. Your results are biased by the way you encode your information. 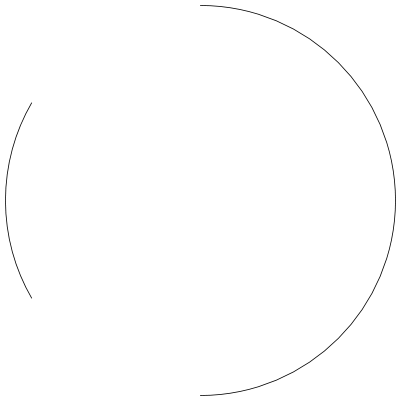 If you encoded your pictures with parts of straight lines instead of parts of circles the comparision of a square and a circle would give you the opposite results (square rather simple but the circle infinitely complex). Now saying that you could just combine the circles-system and the lines-system would not get you anywhere: now circles and squares are both simple (as they are supposed to be) but for example a Mandelbrot fractal (with low Kolmogorov complexity) would still be graded infinitely complex. If you want any usable results you need to use math or any equivalent strong language to encode your picture information. And then again the encoding of a picture is not unique any more and you need to make sure that any image you draw/construct is encoded in the simplest way possible which is equally hard as computing the Kolmogorov complexity. This is not mean as a rant on your article. I love it and your whole blog. It makes me think and teaches me! Thanks a lot for the effort you put into your articles. You make some very good points, and the square counterexample clearly came from a mathematical mind! And I think the only rebuttal is this: the circle framework is not designed to be useful. In fact, it is not hard to see that determining the correct Kolmogorov complexity of any image is undecidable, since any string can be interpreted as the pixel information of an image. So it is not fruitful to search for such a system, because no system exists. Here’s a relatively simple example, however, of a more expressive system that encapsulates both circles and squares: Bezier curves. However, this system is just more complex, and it sidesteps the point of the article. That is, this is a question about aesthetics: are designs with provably low Kolmogorov complexity more beautiful than those with higher Kolmogorov complexity (with respect to a universal encoding system)? Whatever you believe, Kolmogorov complexity is pretty fascinating stuff. I’m planning to look at it in some more depth in the coming months. In particular it has shown up in a number of machine learning applications. I agree that some of my arguments stated the obvious. I just like to write down my though process and make everything as easy to understand as possible. A system based on beziers would certeinly be worth to look into. Especially since they are not that hard to implement. I am looking forward to your future articles about Kolmogorov complexity because I feel that it is very important even though I do not (yet) see how it could be at least approximated and used in any way. I’m a bit late to the paty, but if you want some /really/ good low-complexity art, check old, good demoscene stuff. will produce “00111010010000101101001110101000111101” just fine. For Kolmogorov complexity, your program’s length would include the code required to implement “bin,” as well as the code required to implement array indexing.